Traveling around the blogosphere, I kept seeing the icon for "Presto Pasta Nights." The name of the event is so catchy; it's hard to forget. One weekday last week, we came home to no dinner prepared and we were looking for something quick to eat. Very, very hungry, you see. We had zucchinis and some grape tomatoes sitting around and presto! Here it is, our entry for Presto Pasta Nights. I infused some olive oil with garlic (starting the pan cold and adding the garlic from the start), then added some anchovies. It was then a simple matter of sweating sliced onions and zucchini. The grape tomatoes went in last. The bucatini was a tad too heavy for the delicate ingredients. We were thinking of doing the dish with spaghetti first, but I remembered we had bucatini as well that we wanted to use up. We also realized we still had some feta, so we added some chunks of feta to the dish. Brilliant! 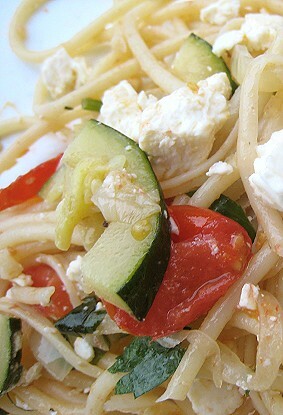 The feta enlivened the dish. This is our first Presto Pasta Nights post. The first of many, I hope. This week's host is Ruth of Once Upon a Feast. 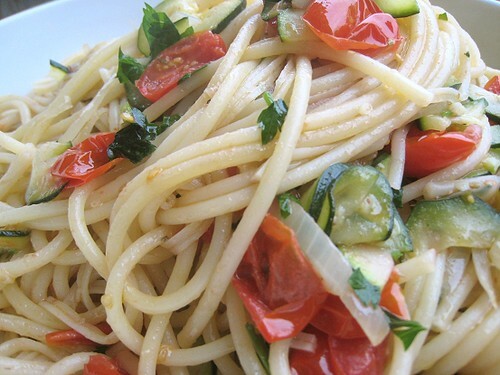 It's a gorgeous, fresh summer dish and I'm really into bucatini of late. And I hope it's the first of many entries to Presto Pasta Nights too! Like Peter, I'm into bucatini these days too, but whatever pasta anyone chooses - the "sauce" is awesome. Great photos, I could lick the screen! my kind of pasta. just what PPN is about. This would be gone in 60 seconds in my house. I'm so glad I found you at the PPN roundup, I accidentally deleted your comment on my blog before I had a chance to visit you. Glad I dropped by though I will be visiting again if this recipe is anything to go by. Looks beautiful and light and delicious! Goat cheese or a nice parmesan might also work well. 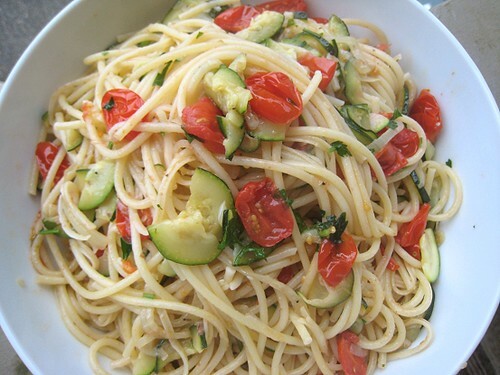 It looks like the perfect dish for the summer! looks really freash and yummy.